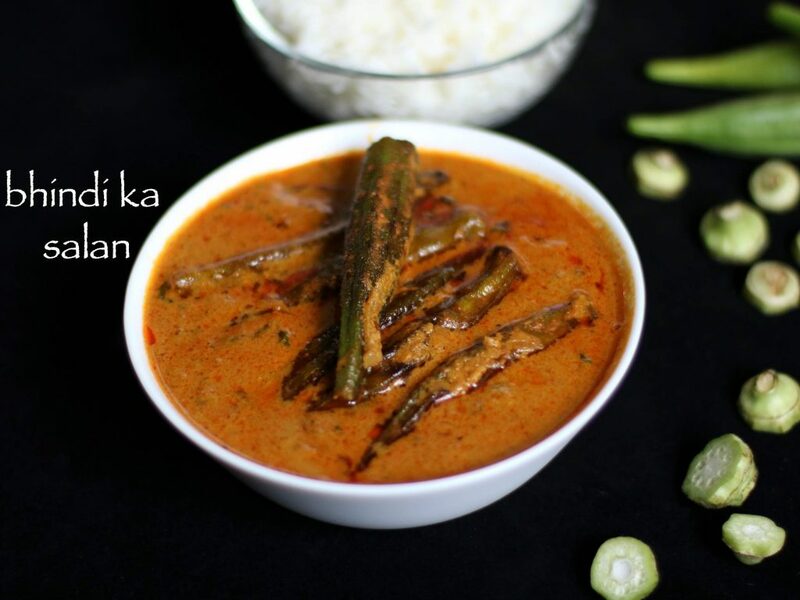 bhindi ka salan recipe | okra ka salan recipe with video and step by step photo recipe. bhindi ka salan is very delicious and goes very well with hydrabadi veg biryani. 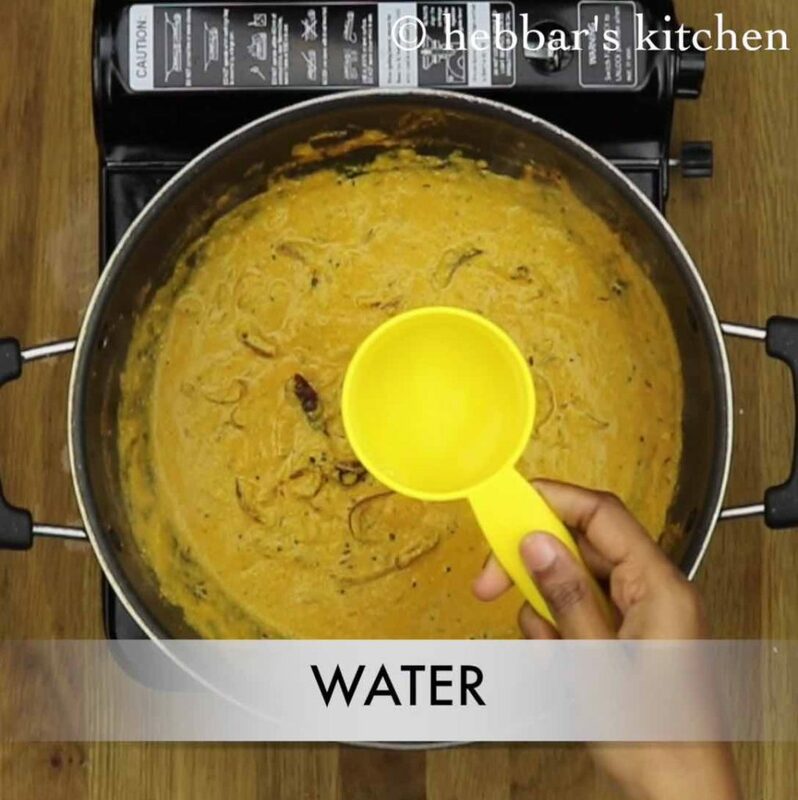 this is popular gravy of hyderabadi cuisine made using okra, spices and tamarind pulp. 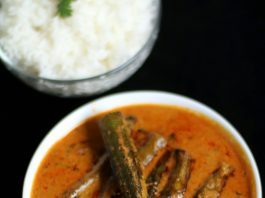 bhindi ka salan recipe | okra ka salan recipe also goes great with any variety of roti, chapathi, jowar roti, akki rotti, plain rice or even with a pulao and fried rice. one of my friend is hyderabadi and she told for most salan recipes, yogurt is used to add up the taste, tanginess to the gravy. however, today i am adding tamarind pulp for the tanginess. 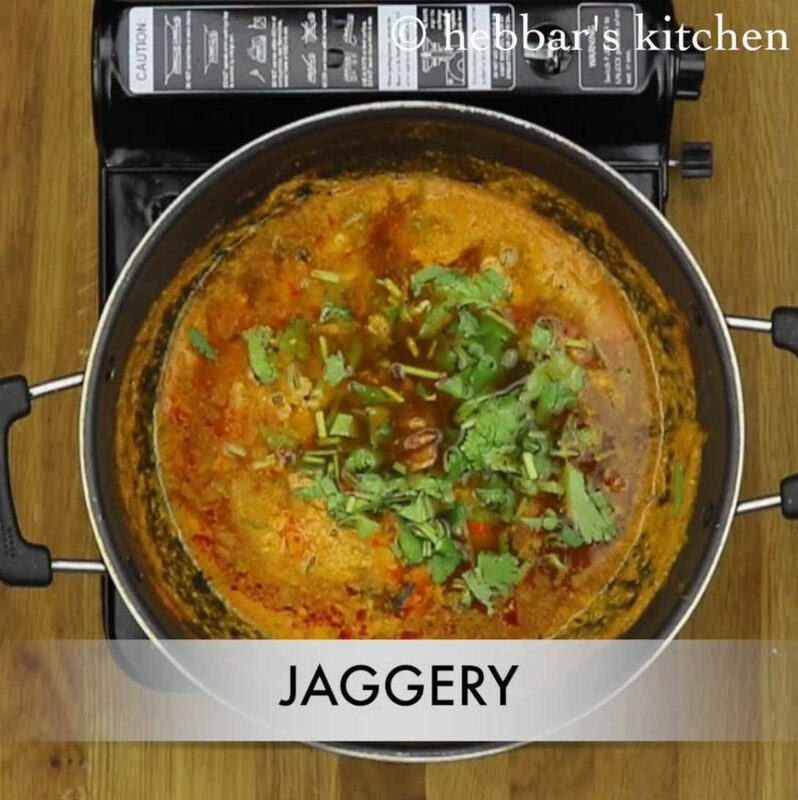 if you like south indian curry recipes then check, bhindi masala gravy, chana masala, veg saagu, palak paneer, stuffed brinjal, molake kaalu palya, aloo bhaji, suvarnagadde palya, sabbasige soppu palya, batani gasi. 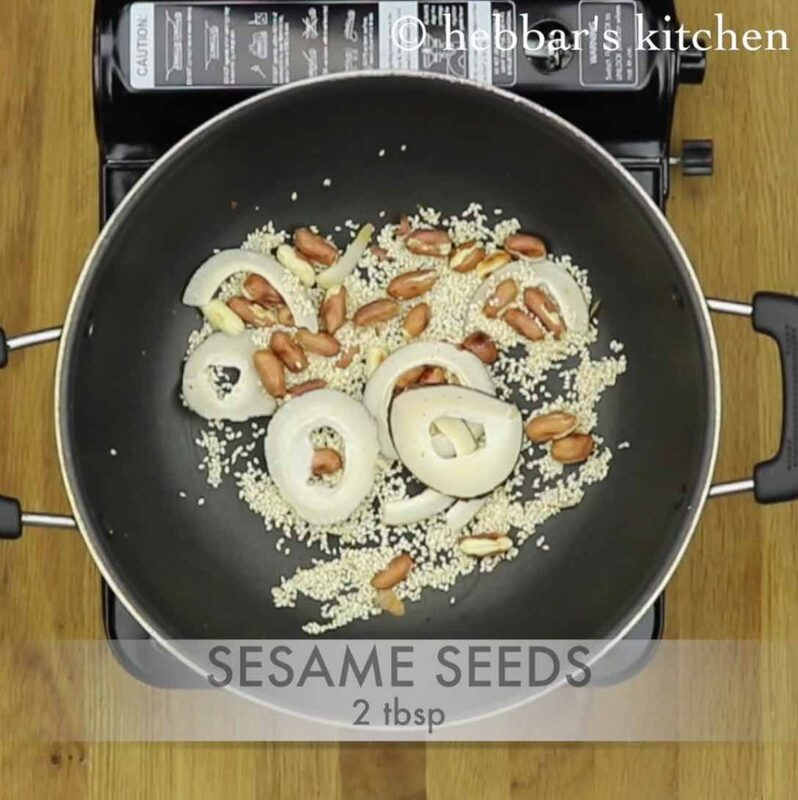 dry roast peanuts, coconut and sesame seeds till they turn fragnant. blend to smooth paste after cooling completely. in the same pan, heat about 3 tsp of oil and fry okras on medium flame. 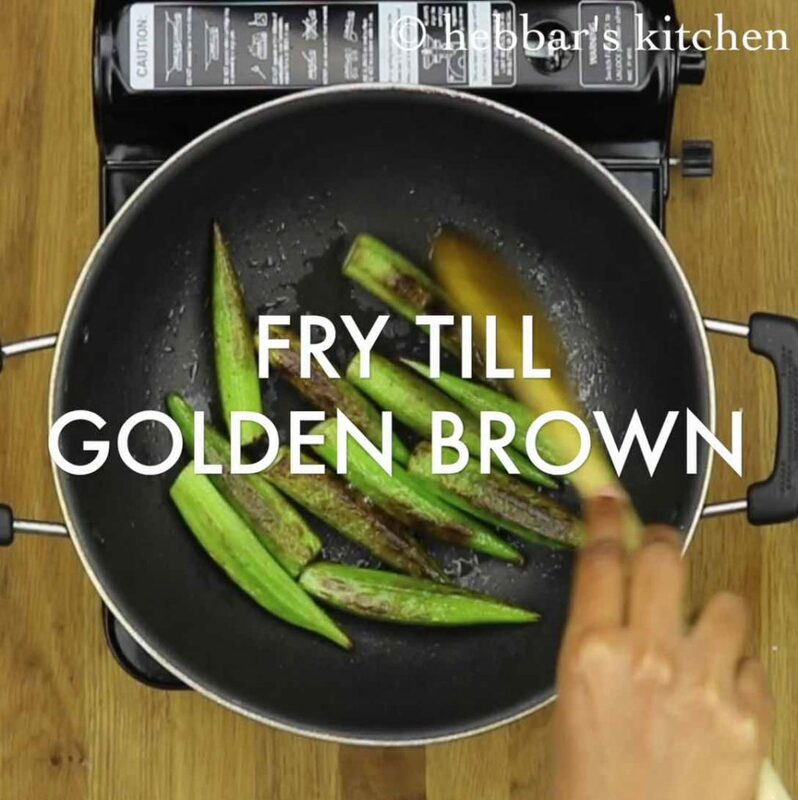 the okras has to turn golden brown. remove the bhindi and keep aside. 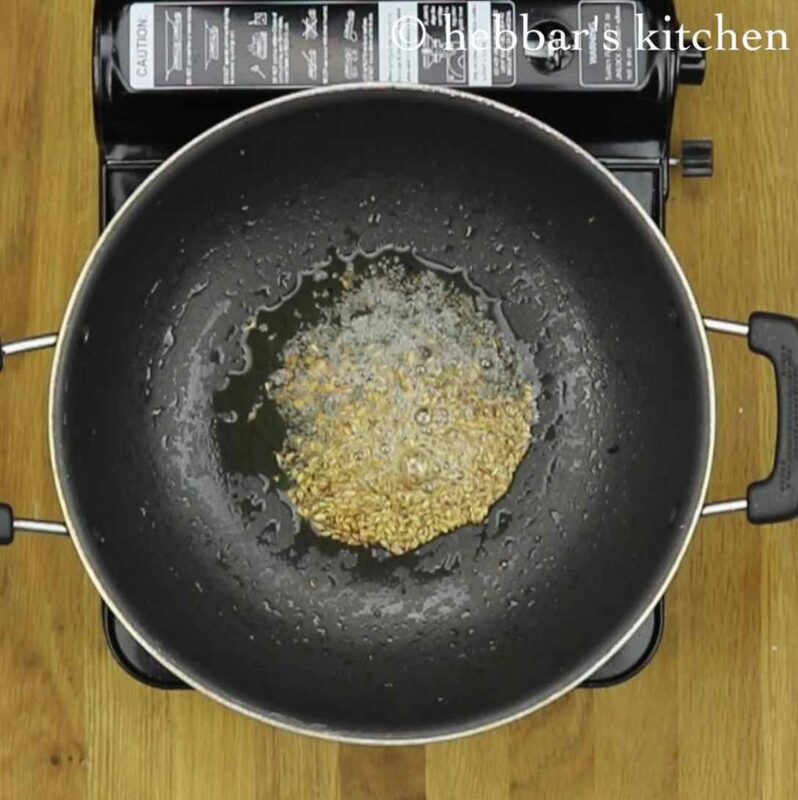 now in the same pan heat oil and add mustard seeds, cumin seeds, methi seeds. fry till they splutter. time to add sliced onions and fry till they turn golden brown. 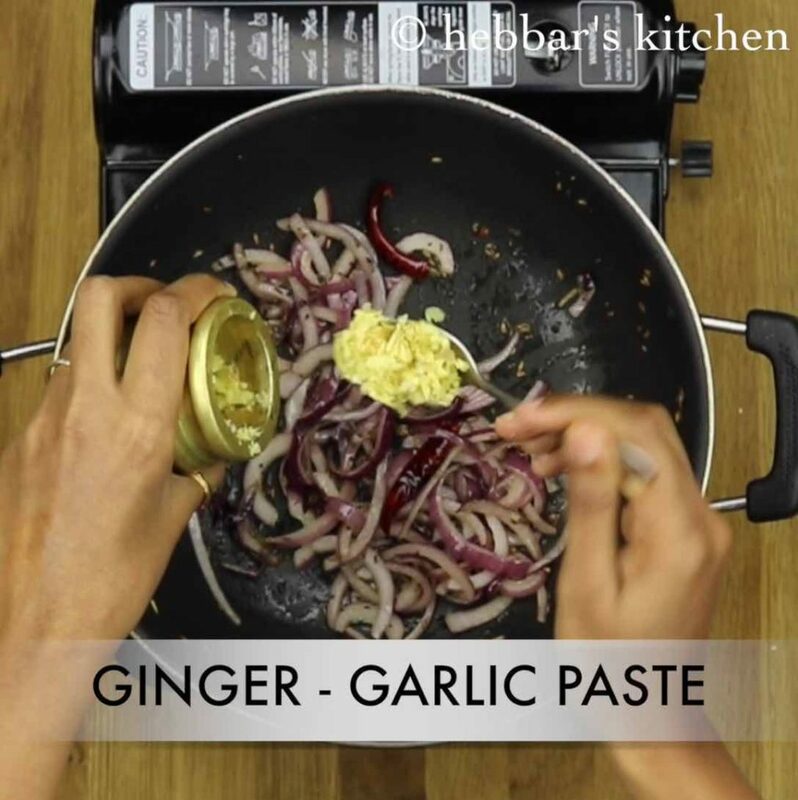 now add ginger-garlic paste cook this till raw smell is gone. 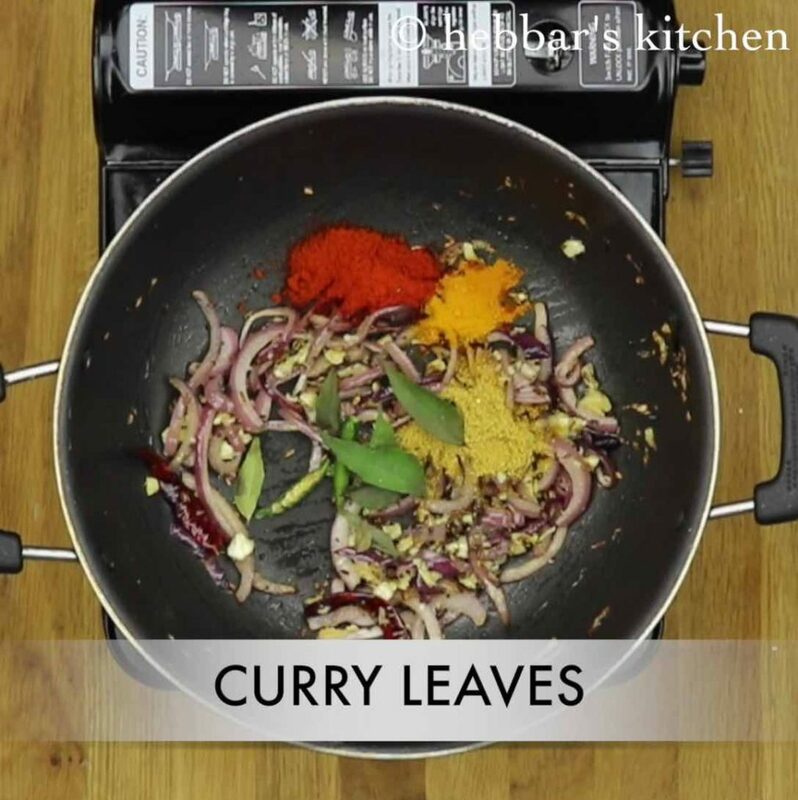 next, add red chilly powder, turmeric, coriander powder, green chilly, curry leaves and fry a minute. keep an eye on flame as the masala should not burn. now to this add peanut and sesame seed paste prepared earlier. add water to make a thin paste. you might have to add almost a cup of water here. cook this on a slow flame for 30 minutes. 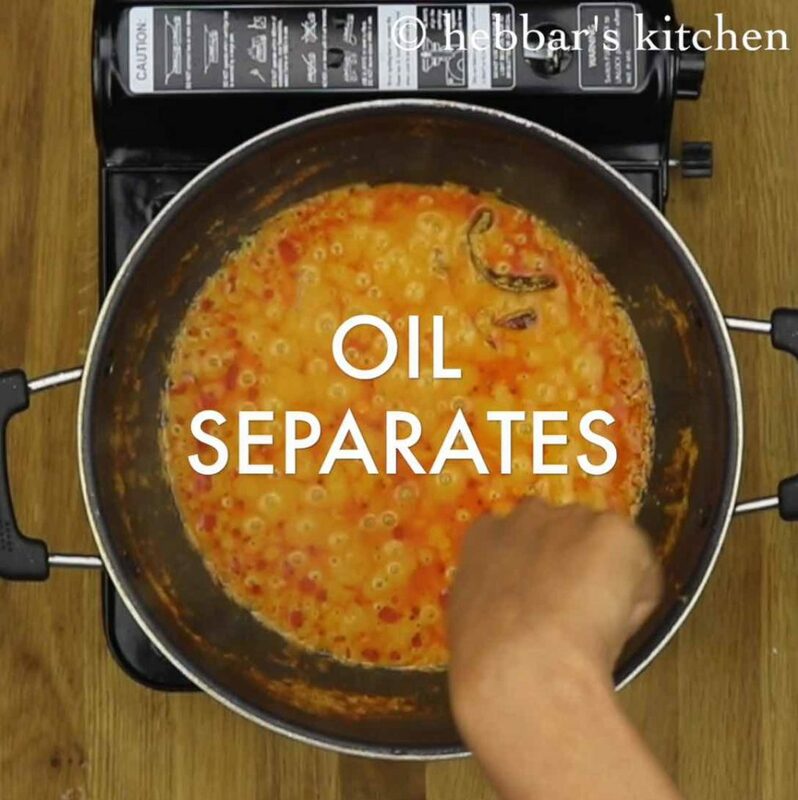 after 30 minutes the oil floats from the sides. keep stirring in between so that it doesn't burn from bottom. 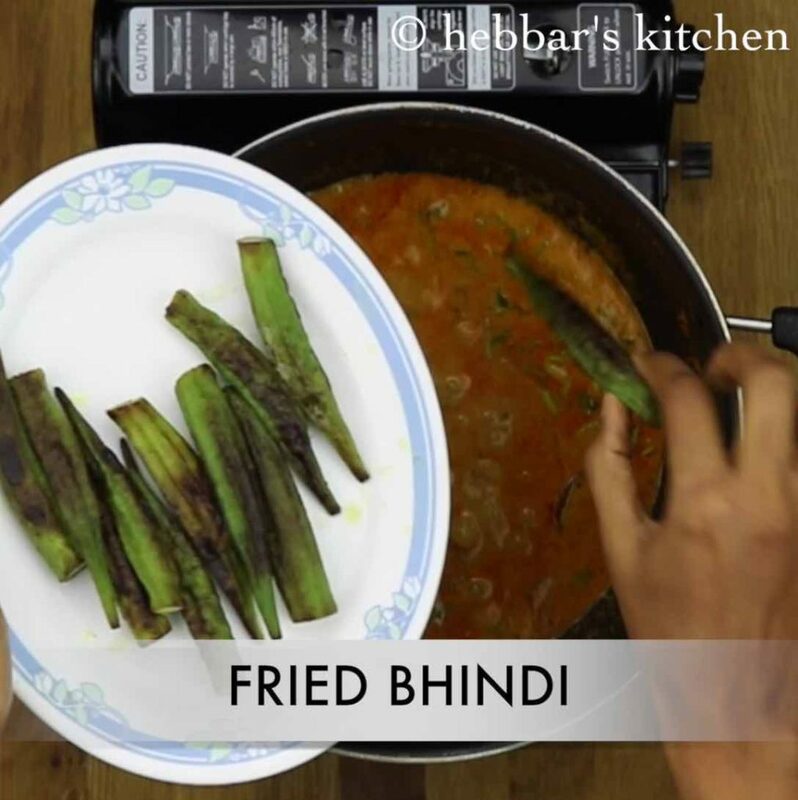 once it comes to boil add fried bhindi and cook this on a slow flame for 5 minutes. dry roast peanuts, coconut and sesame seeds till they turn fragrant. cook this on a slow flame for 30 minutes. after 30 minutes the oil floats from the sides. keep stirring in between so that it doesn’t burn from bottom. 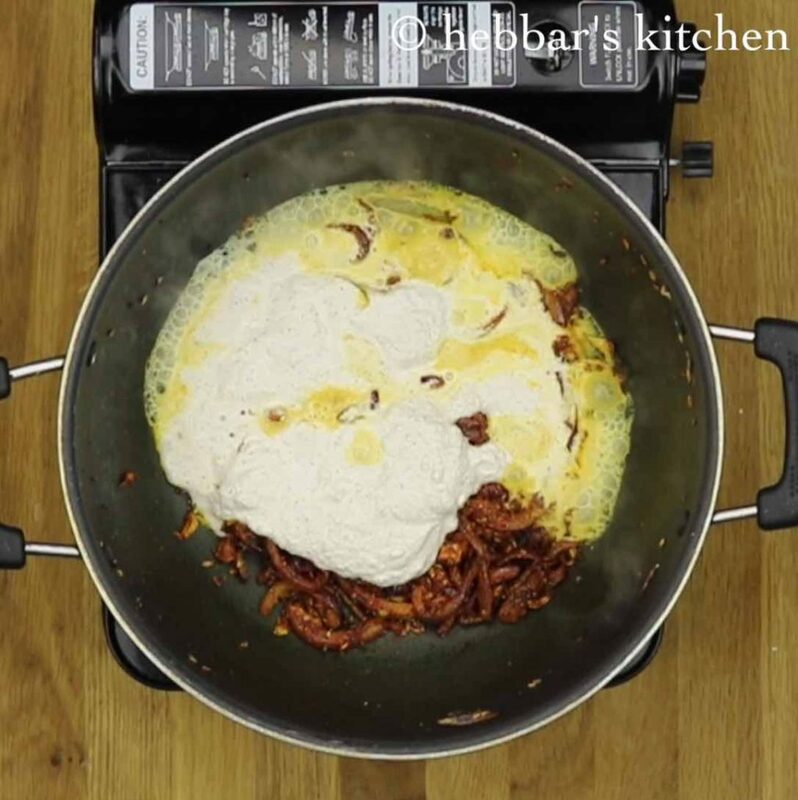 serve this hot with rice or roti or with veg biryani. you can chop the bhindi into half and fry if its not tender and small. bhindi ka salan requires to be cooked on low flame so that the flavours are rich. 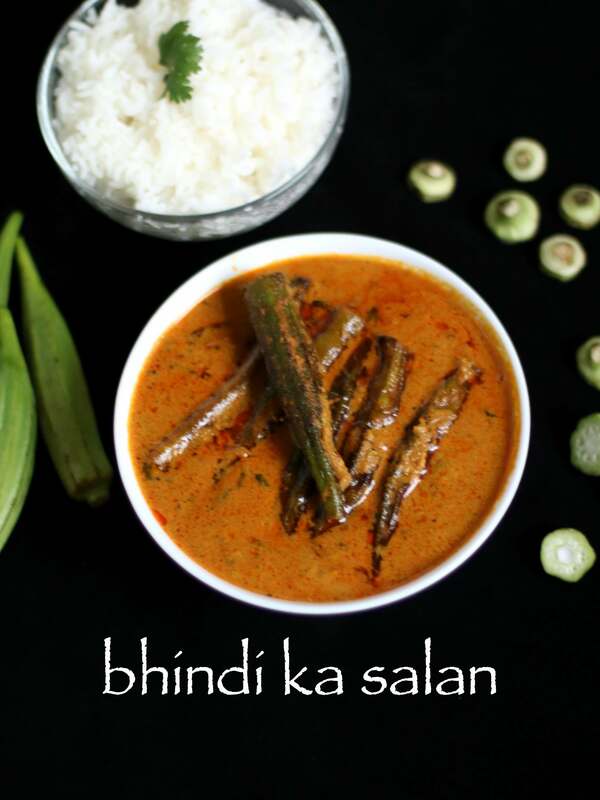 instead of bhindi if you add fried green chillis then it is called mirchi ka salan. Tried this and came out very well…..thanks a lot for sharing this step by step. 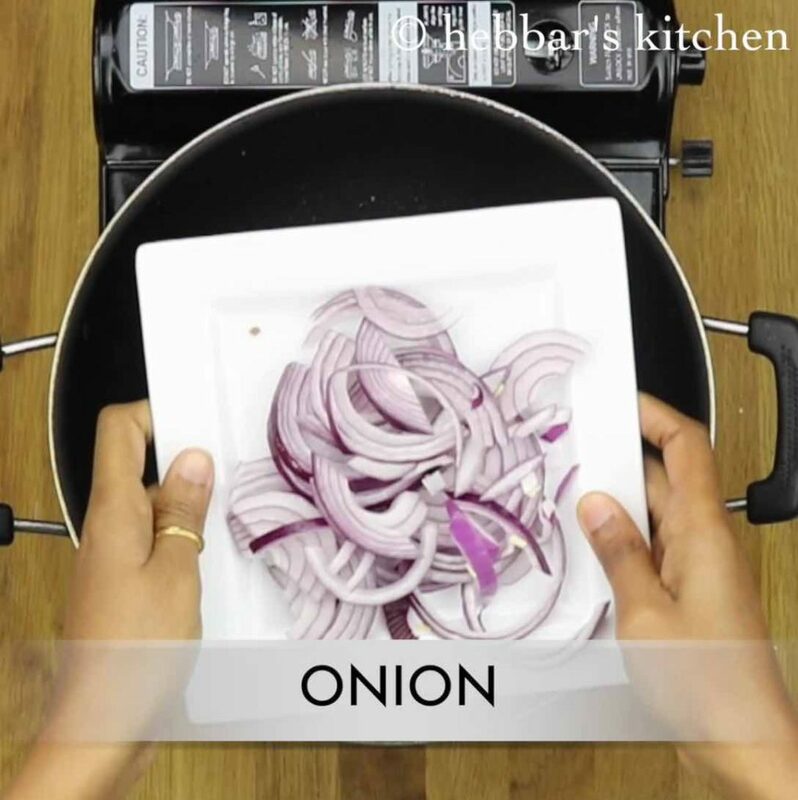 Your cooking steps are perfect and very easy for the beginners!! I tried it came out very well. I like the way you explain in step by step. I like all your recipes too. What if I don’t have dry coconut? I have only moist and sweetened coconut/unsweetened coconut flakes? Which one to use? Hi Shwetha. salt is added in step 11. while adding tamarind juice..